Today's Draw: Five of Spikes from the Ironwing in the Clarification position. Does something have you scared right now? Do you feel uncomfortable admitting to fear? What inside you is getting cleansed? I love the depth of the Ironwing Tarot. The thought behind each card as she lays it out in the book is just so evocative. But I'll be damned if the images say a darned thing to me! For example, I'm thinking many tarotistas might understand why I looked at this card and thought "Three of Swords". And I was thinking what a cool representation with the top spike splitting the other two, which are going through a heart shaped sand dollar. Since the sand dollar has a spiritual connotation (the whole doves and star thing that you can make from the bones inside that are supposed to signify Jesus), I would have thought that something had come between a very spiritual love. In a weird way, that interpretation does work. But this isn't the Three of Swords. It's the Five of Wands. The story here is that these iron rods are striking against a sea urchin and they make a spark, but no fire. Cut to the chase, and this card is about how "great creative potential is temporarily thwarted by lack of lack of knowledge and self-confidence, insufficient preparation, or use of the wrong tool." 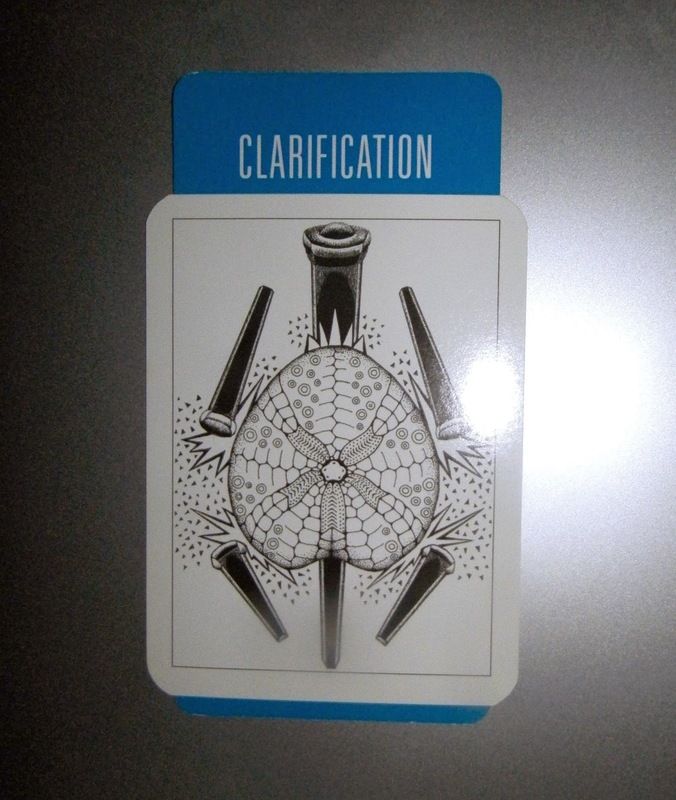 So that's what the card wants to clarify for today. Thanks, card. Like I didn't already know. This describes me right now as my regular worked has slowed enough for me to dedicate a day or so each week to writing a book. Yet I'm finding all sorts of other stuff to distract me. I'm pretty sure self-confidence is my nemesis, though I'm intrigued by the "wrong tool" suggestion. But bottom line is I'm scared. I'm scared to write the book I want to write—or any book—because going down that road requires me to be bigger than I currently am. I'm also scared that I waited too long to make my move. Assuming I'm successful, writing and teaching on the scale I want to write and teach means I'll no longer be as anonymous and invisible as I am now. It means I have to be more careful of what I do and say and to whom I say it. It means I'll at least need to shower and get dressed before going out in public...haha. And it means that, no matter what I say or do, there will be some who see my words and opinions with more importance than they see their own, even though what I really want is for people to discover things for themselves. It also means there will be the next book and the next book to consider, while still talking about the ones that are on the shelves. And it means I'll have to rely on a whole other system of earning and budgeting than the system I know now. Add it all up and I need to grow up in a number of areas that are convenient for me to be immature in right now. On one hand, I feel like a critter who no longer fits into his shell. On the other, I feel like the new shell is far too large, fancy and intimidating for me to move into just yet. And all of this is accompanied by a deep-seated calling to "move others with my words" on a large scale. I feel like this is what I was born to do. Regular readers might know that I "heard/knew" at the age of three or four I was going to be an author (living in Maine), but didn't actually become one until earlier this year. This "prophesy" might account for the fact that I just assume I'll succeed, not that I need anything else to be afraid of. On one hand I'm prepared. I've done much of my inner and outer work. On the other hand, I'm afraid to no longer be what, so far, has been the best "me" I've been in this lifetime. It's not what you'd call writer's block. Words flow through me effortlessly and always have. It's just fear of growth and change. And like the description of this card says, it's temporary. One of the things we can count on for certain is that whatever the vibe is in your life right now, it will change. It's like life is a series of drive through car washes we visit, getting caught up in the different suds of emotions and experiences at each one. And in between is open road, where one vibe gets resolved and another begins to build. Then we drive through again, either getting beaten around by the brushes or shined to a high gloss by the polish. Either way, something in our soul gets cleansed and we get to move further down the road again. This isn't the worst car wash I've been stuck in in my life, nor will it be the last.